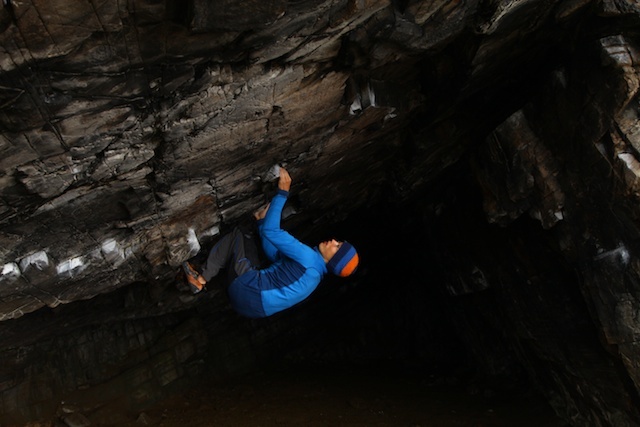 The video of my 8c+/9a from last autumn ‘Fight the Feeling at Steall is now up on the Black Diamond digital catalogue here. It’s on page 9. While you are there you should check out some of the other videos and articles from fellow BD climbers. There are pretty damn good. My favourite has to be The Wheel of Life footage of James Kassay. Would LOVE to go there sometime soon. In 2011 I last visited the Arisaig Cave and kind of felt I’d run out of things to do there. There was one big line left for me to do, a fantastic line following undercuts up a big diagonal flange in the middle of the cave. However, after a play I just couldn’t figure out how to make the feature work as a hold and gave up. It was just too hard for me. It was only when I showed the palce to Flo last month I had another look and had an idea for a sequence that could work. I’m glad I gave it another chance. On that day I couldn’t try it as I’d just injured my knee , but yesterday, I had a good session on it and did all the individual moves. There are no ‘low percentage’ move on it for me, but about 9 or 10 in a row that are all powerful on burly undercuts and pinches. So I have a feeling that trying to link them together will be a good workout. The nice thing is, the normal start should go at something between 8A and 8B, but climbing into it from the cave entrance (about 30 moves of 8A+) will make a very fine climbing challenge indeed to keep me busy, and fit. Today, I feel like I’ve been dragged along a cobbled street on my back. But looking forward to getting back on it. While I was there I also did a great variation to the short side traverse. The original version (about F7c+ since it’s 15m long) goes quite high along a slopey break near the start. There was an obvious low version on fantastically shaped edges, rounded by the sea washing in winter storms of aeons ago. It sussed it out pretty quickly for my warm-up at about F8a. I’ll make up a proper topo for the place shortly. Finally, we have the first stock of the new Scottish Sport Climbs guidebook by the SMC. It’s in the shop here. It has certainly been a long time coming. I first submitted a draft of the sections I wrote in November 2004! A lot of bolts have appeared across the lowlands, highlands and islands since then, so the book is a lot fatter than it would’ve been if it had been released at that time. So the wait has an upside. Flicking through the guide as I took it out of the box, I was struck by the great selection of sport crags all over the country now. There are 1300 routes in the guide, on 100 crags. Who out of the slightly older generation of Scottish climbers would’ve thought we would have 1300 sport climbs in Scotland. That’s great! As you’d expect from an SMC guidebook it’s a nicely produced book with careful descriptions, good maps and plenty of nice pictures to inspire. So many of Scotland’s new routing activists have been very energetic over the past decade and the options now available for routes to enjoy has basically exploded. Now, there are sport crags for us to visit no matter what corner of Scotland you find yourself in or fancy travelling to. Also, the diversity of locations mean that I can’t see many days of the year where there won’t be some dry rock on which to clip bolts somewhere in the land. Kudos to all who made the effort to open new sport routes, as well as all the authors and producers of the guide. It is so badly needed. Talking to the new generation of young sport climbers coming into climbing through Scotland’s climbing walls, it frequently nagged at me that so many are unaware of the lovely crags that are out there. Some of them in stunning, wild and far flung locations like Gruinard in the north west. Some of them just up the road from our major towns and cities. The guidebook pictures brought back some nice memories for me of places like Dunglas just outside Glasgow, where I did my first 6b (Negotiations With Isaac)and 6c+ (The Beef Monster). I remember being very excited when Andy Gallagher asked me to give him a belay on the first ascent of Persistence of Vision (7a+) after watching him bolt it. A year after my first 6c+, my first 7c+ (Dum Dum Boys) was a liberating experience and straight away I wanted to get to the ‘happening crags’ of the day. I found myself at Steall for the first time shortly afterwards, abseiling down Cubby’s project (Ring of Steall 8c+) and being totally inspired by how poor the holds were. The whole ambience of hard physical climbing in beautiful highland surroundings was where it was at for me. So in the following years, we made after school/uni/work hits from Glasgow to Glen Ogle, Dunkeld and Loch Lomondside sport crags, with weekend trips to Tunnel Wall, Steall, Weem and the Angus Quarries. 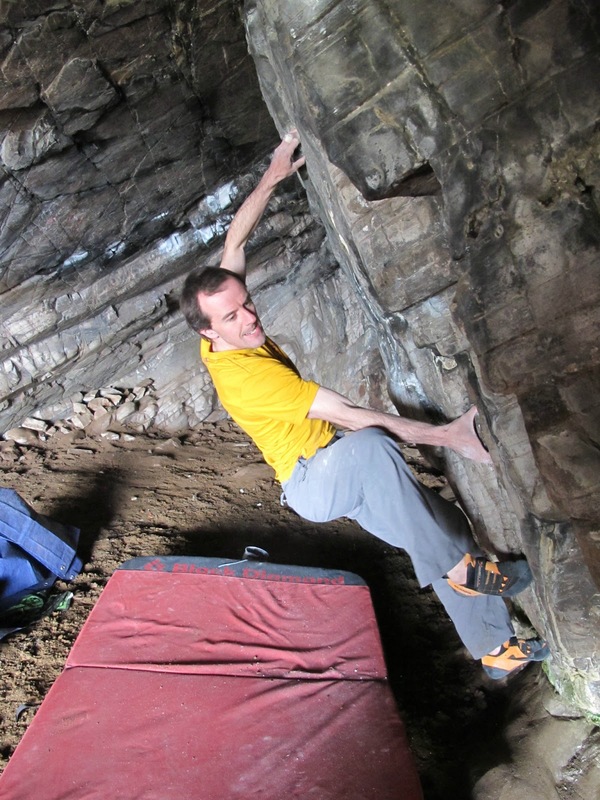 Once I got involved in exploring new routes, under the influence of Dave Redpath and Michael Tweedley, I immensely enjoyed tearing about bendy roads in Argyll developing crags like Tighnabruaich and eventually the Anvil. One thing that I like about Scottish sport climbing particularly is that the easier graded routes in the 6s and 7s are often so much better to climb than those on the continent. In Spain or suchlike, the majority of the time, the hard routes on big overhanging sweeps of limestone are the most inspiring lines, while the easier lines can sometimes be either a bit scrappy or, dare I say it, a little boring. As with our trad, the variety of rock types we have in Scotland often make for much nicer routes in the lower and mid grades too. However, if you are into hard stuff, the two hardest routes in the book (Hunger, 9a and Fight The Feeling, 9a) give as good climbing as you’ll get anywhere. Both were climbed in good conditions in the summer and you wont find any queues or some barky dog wondering about eating your lunch at the base of the crag. 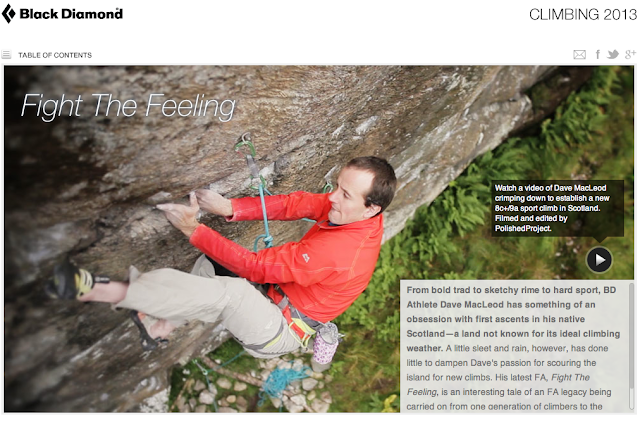 The only negative on offer from Scottish sport climbing is, of course, the midge. Just remember that the wind direction is as important as the rain when you look at the forecast. Choose a crag exposed to a breeze on the day, and you’re sorted. Enjoy the guide, enjoy the climbing. It’s here. We’ve just added three new books to the shop, all very different. First up is The Boulder by Francis Sanzaro, published by the Stone Country Press. 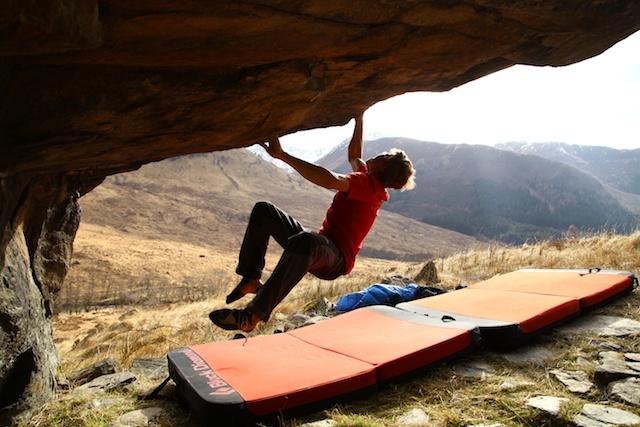 What does it mean for us to be involved in bouldering? How does it’s movement and sporting challenges relate to other activities like Parkour, dance, gymnastics, martial arts, or even art disciplines like painting. Are you doing it to engage in a sport? Simply play on rocks? Compete with others? Enjoy movement. Possibly all of these and many more reasons besides. 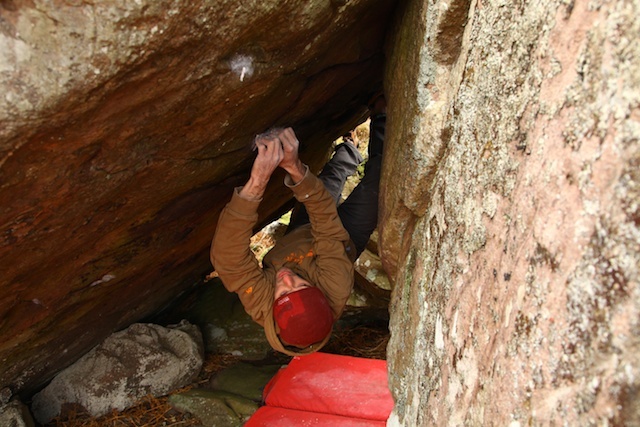 The boulder explores the philosophy of bouldering, what it can mean for boulderers and how we can use and examination of this to improve both our bouldering and what we take from it. 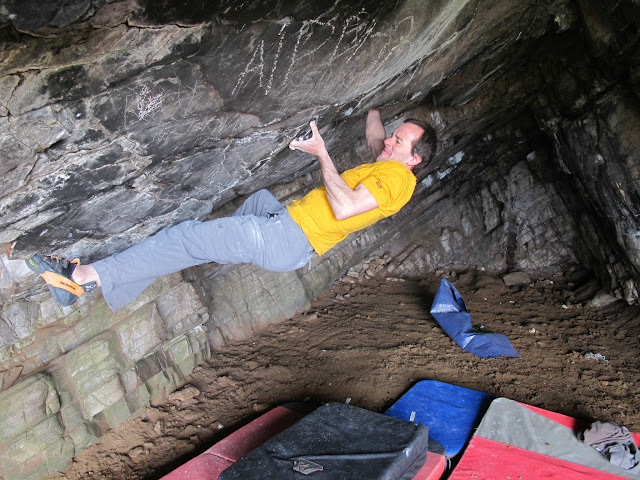 For many readers, discovering bouldering will no doubt have changed your life. But surely starting out in a new found activity isn’t the end of the story? There are many life changes to be found as you learn more and more about what bouldering is doing for you. I would expect most readers to be helped along this path. It’s in the shop here. Next is Fiva by Gordon Stainforth, which is only recently out but fast accumulating a big reputation for a brilliant read. Gordon was previously more famous for his excellent photography books. Eyes to the Hills was one of the first mountain books I borrowed from my library as a 15 year old novice climber. We don’t tend to get many mountaineering stories in the shop, but Gordon’s big win with this book at the Banff Mountain festival in November prompted us to check it out and we were impressed. I won’t say too much about it other than it describes a death-on-a-stick epic on Troll Wall in Norway. If you know anything about how serious the Troll Wall is, the Fiva route sounds particularly toe-curling just to read about. Much recommended by us if you like reading about proper adventures. It’s in the shop here. Finally, and with some satisfaction I can finally report that we have the first stock of the new Scottish Sport Climbs guidebook by the SMC. I wrote a reasonable chunk of the text myself, and since I first had a draft of ‘my’ crags completed in November 2004, I can appreciate as much as anyone how long it’s been in coming. A more substantial introduction to the book is coming in another post in a minute, but for now the book is in the shop here. DAVE (with Dave MacLeod) from MOUNTAIN EQUIPMENT on Vimeo. Since I’ve been out of the blogging loop for a bit, this is a bit late and you might already have seen it. Anyway, below is a film that Polished Project made about me. It’s not so much about a specific climb or anything, although there is some footage of me climbing some classic hard problems at Magic Wood. It’s really about ideas of mine and quite important things I’ve learned over almost 20 years of climbing. I suppose the central idea underlying everything Im saying in the film is that I learned the things I did through not being naturally suited to climbing as youngster, but very naturally suited to spotting the patterns behind others apparent talents and trying to copy them. Thanks to Mountain Equipment who supported the film. I’ve been working with ME for ten years - about half the time I’ve been a climber. 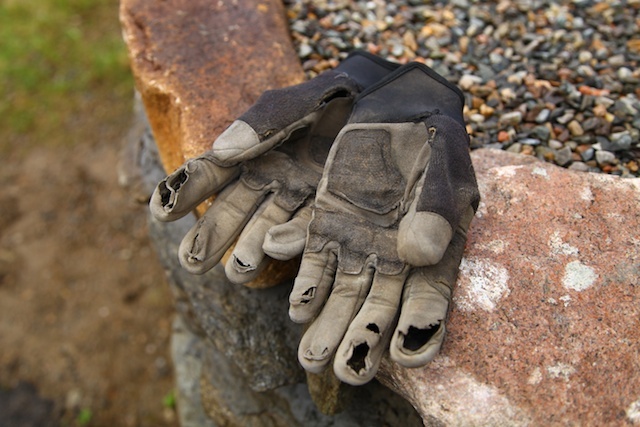 So they have been quite a big part of my life as a climber. Nevis Landscape Partnership film with Dave MacLeod from Dave MacLeod on Vimeo. Who looks after and somewhere as special as Ben Nevis and Glen Nevis? It’s not something that we’re always constantly aware of. Whatever special mountain areas you visit, you might only see the mountains and not all the work that keeps them as they are. But you’d soon notice if all the tons of litter dropped on Ben Nevis every year was allowed to accumulate, or if the paths were allowed to disintegrate into sprawling scarred muddy bogs. Or if poor planning allowed some rather ill advised developments to permanently change the shape and look of the area. And then there's all the things you might not immediately notice, but are just as important, such as the changes in which plant and animal species thrive as the environment changes. Although the untrained eye might not see that sort of thing, it's obvious to everyone that the place is full of life and that is what makes it great. If that was threatened it would be pretty important. For many years, the Nevis Partnership took on the role of looking after the Nevis area. For various reasons, the organisation has evolved into the Nevis Landscape Partnership who will be doing lots of good projects in the coming years to help us all enjoy the place and keep it as good as it is. We made a short film for them through the lens of my involvement with the place. It’s just meant to let you know that the NLP are there and that there are many fields of interest which you might want to get involved in, if you like. Their Facebok page is here. Work has been done. Everything looks better, apart from my work gloves. About 4 years ago I had a similar break in blogging for two or three months. The common reason was primarily moving house. I am moving house shortly, and with it comes the need to do shed loads of work. After work, climbing and family time, there is little time left over. However, the physical work tasks that need done are only half the story. Usually, it coincides with a larger transition in life, moving on to a new chapter. So in all aspects of life, there are old things and ideas to let go of and new things to grapple with. Such has been the last three months for me. I’ve done this a few times now. So although it’s a scary process, I tend to grab it with both hands since it’s important. Since completing a lot of huge climbing goals over the past few years, I enjoyed a good bit of just going with the flow, choosing what to climb based purely on what the weather is doing or what friends suggest. I visited some new climbing areas. After spending last spring in Switzerland I chose to stay at home this year which was a good choice since it didn’t rain for two months! I put good few days into preparing for a cool climbing enchainment idea I’ve had. I was in good shape for it and really psyched, but sadly the weather just didn’t play the game. Either the winter routes were white but the rock routes wet or vice versa. Such is the gamble. It was worthwhile to do the prep since I now know that I can do it. I might try another enchainment with only rock routes which will be a bit less weather dependent in the short term. I tried to go trad climbing, but it was freezing. Every time I take a rope to go climbing lately it seems to start snowing. Winter is taking a long time to give in in Scotland. Yesterday (May 2nd) it was still snowing on Rannoch Moor and I see yet more fresh snow on the hills this morning. The other day I sat for the whole evening making a new list of mountain crag projects to try when the May sunshine finally arrives. I can’t wait until I get the chance to start afresh on some mountains and islands I’ve never been to. But for now, the trad season is still a list on my notepad. Sport climbing has also commenced, with a lot of hanging on the rope warming numb hands. I went back to Malc's 9a at the Anvil and seem to have finally figured out some beta that works for me after Malc turned the crux hold I used to dust, breaking it off when we were trying it 6 years ago now. I also did some running. Not a lot really, but some. And I was enjoying it a lot. My troublesome ankle hurt, as expected. So I might have to take a break from that again. This made me somewhat depressed for a while. Speaking of injuries, A little setback came when I was doing a deep drop knee on my board at home. I’d just had a brilliant session and felt strong for the first time in months and ‘crack’ went my MCL and hamstrings tendon in my knee. Partial tears. It could have been a lot worse. For ten minutes I thought I was in ACL and meniscus hell. 10 days off running and 14 off climbing were all that was necessary, although I still can’t quite burl down on a heelhook just yet. The lesson? Dropknees are still my favourite move, but they are dangerous. Be careful. I spent the time off building steps, walls, paths, sheds, floors etc at my house to get it ready to sell. Mixing cement gives you big shoulders and helps you sleep at night. Well, unless you are still mixing another mix at 3am. During all these adventures, I went through a bit of a low. I realised that some things in my routine have to change. It’s not to say that what I was doing was bad - I’ve just completed that stage. I badly need some new badass projects to work on. My friend Nick Dixon used to say he needed a big project every 5 years. I don’t last so long! I have some good trips planned for later this year, but I’m rubbish at training for distant trips. So now that I have sorted out some goal routes, I can prepare for them much better. Flo from the Mountain Equipment team was over for a few days. The weather was perfect and we had our pick of disciplines (providing we didn’t mind getting cold). Flo was keen to boulder, so we headed to Torridon, the Arisaig Cave and Glen Nevis. It was quite strange for me to visit some of these favourite old haunts of mine with someone else. 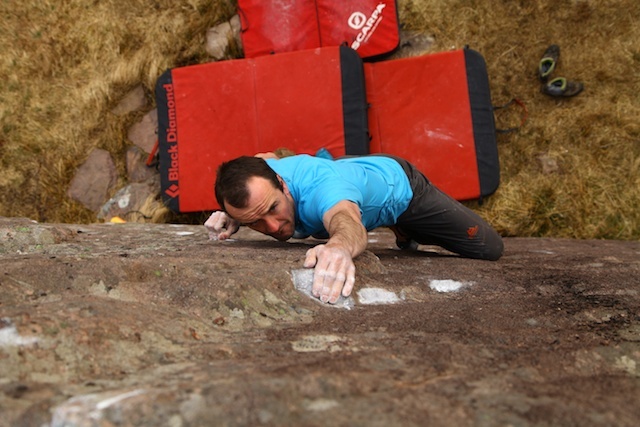 Normally you won't see another soul at most highland bouldering venues. Flo enjoying Inward Bound 7B, the classic of the Arisaig Cave. 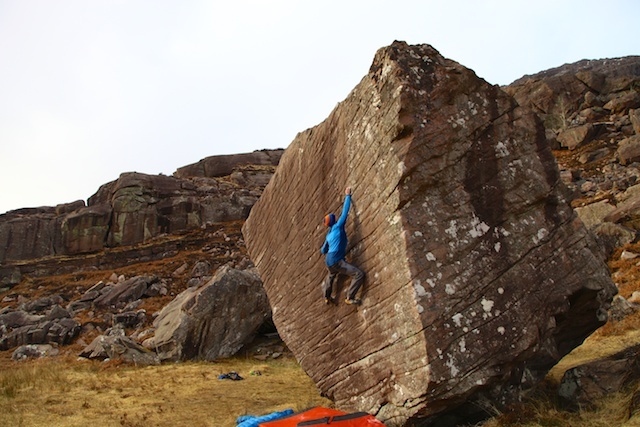 Flo clinging to the ship boulder (The Mission 7B), Torridon. Eyeing up the next edge on A Bridge too far 8A, Torridon. I hadn't visited the Arisaig Cave for 2 years because I'd basically run out of projects. The one great line still to do there just seemed too hard last time I was there. But having a look at it (As in standing on the ground, just looking, as I still had only one functional leg) I decided that I really ought to return for another scrap with it. Likewise in Torridon I discovered a couple of great lines to go back for soon.